The Federal Trade Commission (FTC) has continued its crackdown against medical apps, this time with Ultimeyes in their crosshairs. Developed by the aptly-named, California-based Carrot Neurotechnology, this vision training app aimed to improve visual acuity. The company was initially charged by the FTC in September 2015, and a final order against them was approved by February 2016. In the vision training app, users are presented with a series of vision challenges, with post-exercise score tracking and vision assessment data, available for both iOS and Android. The developers have published several studies on the topic, including one in Vision Research reporting improvements in central and peripheral acuity, amongst a controlled study population of participants with normal vision. Reading through the provided summary and FTC published commentary on public comments, it appears the FTC was most concerned with the level of evidence presented to support the claims made for this vision training app. They acknowledge ” proposed complaint in this matter does not challenge the validity of perceptual learning in general or the evidentiary standards for conducting basic research in this field” and that Seitz included peer-reviewed, well-received research on Ultimeyes. However, while they do not delve too far into specifics, they are concerned about the lack of a complete, randomized and blinded study to support the intervention. As noted above, participants in the baseball study were not randomized or blinded. Thus, the FTC argues the claims made by Ultimeyes were not backed by a level of evidence they felt was appropriate for such claims. They also present possible methodology as samples of blinded studies to an app intervention. We previously covered the enormous fines levied against brain-training app, Lumosity. In that case, the FTC also criticized the limited scientific evidence presented by the company to support its claims of medical efficacy in staving off Alzheimer’s and other cognitive impairments. 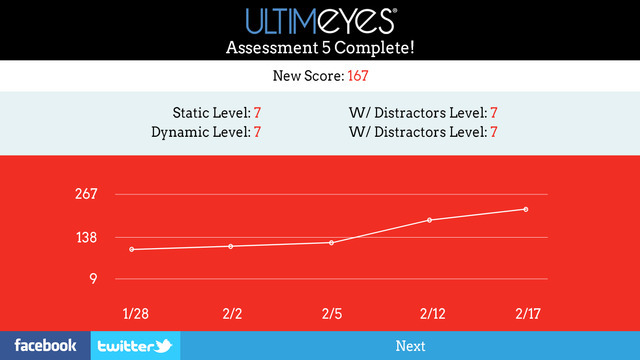 Both applications have somewhat similar brain-training concepts, with Ultimeyes geared primarily to vision training. Given the almost Wild-West environment of the mobile health marketplace, it is encouraging to see greater regulatory oversight though interesting that it’s the FTC taking action rather than the FDA. In light of such regulation, hopefully innovation within the mobile health market will not suffer, as such hefty fines could easily decimate a small mobile application developer. It’s clear the FTC is looking for high-levels of evidence, with their filing criticizing Ultimeyes for not having a blinded and randomized subjects in this study. Is the bar set so high at this point that mobile app companies will consider seeking some sort of “clearance” from the FTC before promoting any app with treatment claims? At the very least, concerns over these possible consequences will encourage greater quality of evidence before medical claims are made for health apps and more collaboration with researchers to prove an app’s effectiveness.